The HP PageWide Pro 477dw Multifunction Printer is one of the series of HP’s PageWide business printers that combines print quality, print speed, energy efficiency, low cost and printing security into a single device. As a multi-function device (MFP) to meet the demands for an all-in-one (AIO) commercial printing machine, the 477dw is capable of printing, scanning, photocopying, faxing and providing email and cloud services. The 477dw Printer delivers a low total cost of ownership and lasting value with the professional results that you would expect. The 477dw Printer has a 1.2GHz processor along with 768MB of memory for quick, smooth performance. The new PageWide technology comprises of a page wide printhead consisting of 42,240 micro-sized nozzles producing professional-quality color and monochrome prints at remarkable printing speeds. Both monochrome prints and colour prints can be printed as fast as 55 pages per minute maximum (speed depends on the content of the prints). Since no heating or warm-up time is required before printing, the first page will be delivered in the output bin within 7 seconds (6.5 seconds for a monochrome print). For high-quality prints, the 477dw Printer produces coloured prints at 2400 x 1200 dpi maximum resolution and 1200 x 1200 dpi maximum resolution for monochrome prints. HP’s 477dw Multifunction Printer uses a four-ink cartridge system to produce bright and vivid colours on paper: black, cyan, magenta and yellow. Each color cartridge provides roughly 3,000 colour prints before the need for replacement and roughly 3,500 monochrome prints for the black cartridge. 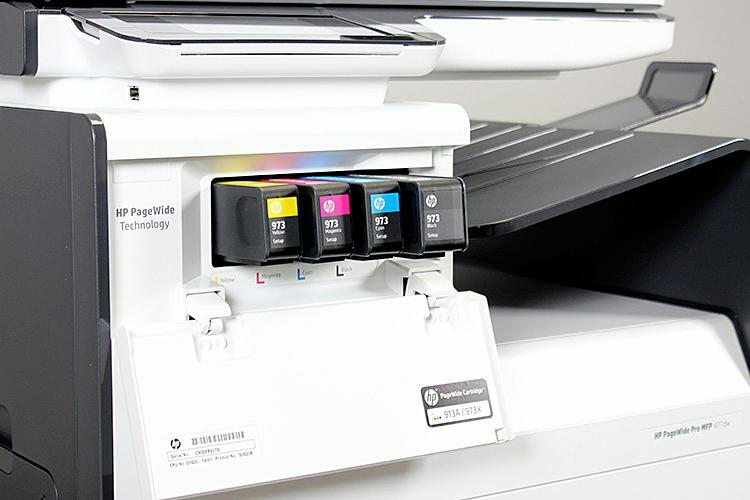 If you want to print more pages and replace cartridges less often, HP offers high-yield cartridges for the 477dw Printer. These high-yield cartridges will provide roughly 7,000 colour prints or 10,000 monochrome prints before the need for replacement. Of course, the number of prints per cartridge is based on the content of the printed pages along with other factors. This HP printer has a width of 53cm, a length of 40.7cm, stands at a height of 46.7cm and weighs about 22.15kg. All tasks can be managed from a small 4.3 inch Colour Graphic Display (CGD) touchscreen display. Under the display is a USB 2.0 port for plugging in storage devices such as USB drives. The 477dw can print Microsoft Word and Microsoft Powerpoint files directly from a USB drive and save scanned images and documents unto the USB drive. The paper tray at the front of the printer has a capacity for 500 sheets of paper while the multi-purpose tray at the side of the printer has a capacity of 50 sheets. The output bin can be occupied by a total of 300 sheets of paper all faced down. The printer supports plain paper (letter, legal, A4, A5, A6, B5, B6, Oficio and 10 x 15cm) photos, envelopes (B5, C5, C6 and DL), labels, cards and specialty papers. With a 10/100 Base-TX Ethernet port, the 477dw printer can be connected to a network to provide printing access to all computers on the network. If there is a need to go cordless, the built-in 802.11 b/g/n Wi-Fi adapter grants the printer access to a wireless network for wireless printing from any computer connected to the accessed network. 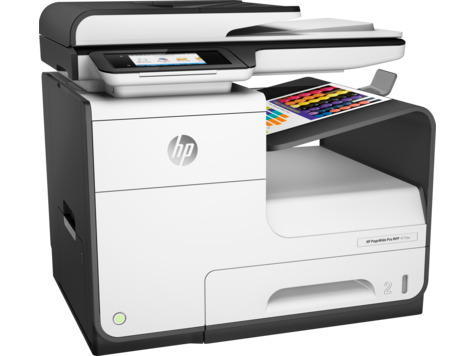 The printer supports the use of HP Jetdirect Print Servers and Apple AirPort series of devices including Express, Extreme and TimeCapsule. These devices create a wireless network by which computers can be wirelessly connected. Once the 477dw printer is connected to any one of these devices (via USB), all computers connected to the wireless network will have access to the printer’s services. HP ePrint, Apple AirPrint, Wireless Direct Printing and the Mopria Print Service app are all supported to allow printing from a smartphone or tablet. Also, Wi-Fi Direct and NFC support allows mobile devices to connect directly to the printer instead of connecting to a wireless network first. The 477dw also supports Google Cloud Print 2.0 allowing printing from Google online applications such as Gmail and Google Docs. HP’s PageWide series of printers are energy-efficient, commercial printing machines providing professional-quality printing and high printing speeds with smaller energy consumption. The average power consumption of the 477dw printer is roughly 44.4W during printing tasks, reaching a maximum of 115W. The printer uses more than 5 times less energy than average commercial printers that normally consume roughly 300~400W of power during printing tasks. The automatic sleep mode shuts down most of the printer’s machinery in order to save energy when not in use. The 477dw printer is built to be compatible with all current computer operating systems to eliminate any issue of computer compatibility. The printer is compatible with Microsoft Windows 10, Windows 8 and 8.1, both 32-bit and 64-bit versions of Windows 7, and even the 32-bit version of Windows Vista. Apple’s OS X operating systems are on the compatibility list with versions 10.11 (El Capitan), 10.10 (Yosemite) and 10.9 (Maverick Lion). And thanks to the pre-installed HPLIP software, the 477dw printer is compatible with the Linux operating system. The attractive feature of the 477dw printer for commercial use is security. From boot until shutdown, the 477dw protects sensitive data with over 100 security features. These include firewall and the use of data encryption during communication between printer and computing device. The printer has a password protected embedded web server for secure browsing using SSL security. If there is an attack on the network detected by the 477dw printer, it shuts down automatically to prevent data theft via hacking. There is also security when printing on the network. Attaching a pin to a printing tasks pauses the tasks until the pin number is manually entered at the printer. It keeps your private printing jobs secret until you arrive at the printer. The HP PageWide Pro 477dw Multifunction Printer operates with the speed of a laser printer while providing the quality of an inkjet printer. 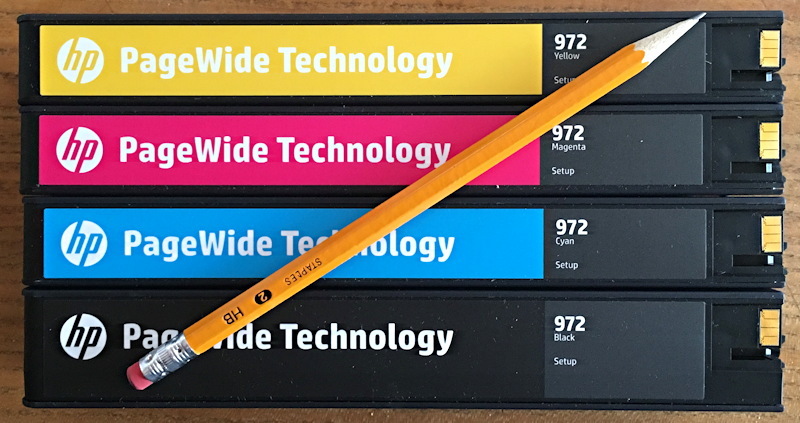 The 477dw is fast, prints excellent graphics and great-looking text, and its running costs are very competitive. 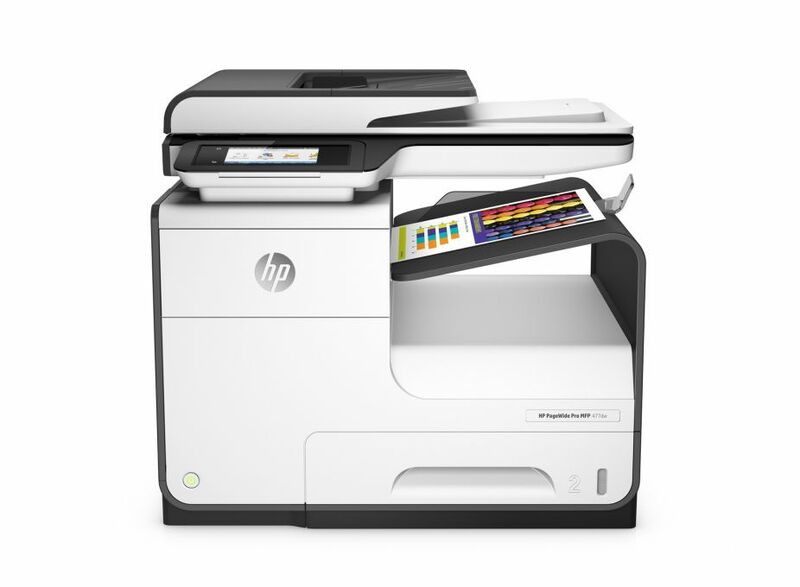 Where can you purchase the HP PageWide Pro 477dw Multifunction Printer? At Microless, the place with the most competitive and best prices for your computer hardware needs. Buy HP PageWide Pro 477dw Multifunction Printer on Microless.